J.C. Blair Memorial Hospital pharmacist Todd Fortney goes over the supply of flu vaccinations. Though confirmed cases of the flu have been found in the county, the number is lower than last year this time. Confirmed cases of the flu have been found in Huntingdon County this flu season, but according to J.C. Blair Memorial Hospital officials, the number isn’t as high as it was this time last year. Information by the state Department of Health, six cases of the flu have been reported from Sept. 30, 2018, through Dec. 29, 2018. All of the cases reported to the state Department of Health so far have been Type A. But, according to Brown, the number of flu cases reported so far this year is fewer than what was reported in the 2017-18 flu season. “We are seeing about half of what we’re seeing this time last year,” she said. That is on par with information Amy Whitsel, nurse practitioner at the J.C. Blair Convenient Care Center, provided. Brown also noted flu season peaked later this month last year. A reason behind the lower numbers from last year could be related to the mild weather, as more people are spending less time indoors in confined spaces as the weather has been warmer in recent weeks. Brown said people can always take steps to prevent the spread of the flu, with the most important step being to get a flu vaccination. Flu vaccinations are available at the hospital. She also gave an important recommendation if one does contract the flu. Brown also gave tips to help spread any viruses, including the flu. “Try to avoid close contact with sick people,” she said. “If you or your child gets sick with flu-like illness, the (Centers for Disease Control) recommends that you or your child stay home for at least 24 hours after the fever is gone except to get medical care or for other necessities. The fever should be gone without the use of a fever-reducing medicine. A pair of unrelated retail theft cases are bound for trial later this month in Huntingdon County Court. The county called 125 residents for jury duty Monday morning and from that group seated two panels, one to hear the commonwealth’s case against Denelle Fortson, 45, of the Mount Union area, and the other to determine the state’s case against Brandy Price, 37, of the Huntingdon area. Huntingdon County District Attorney David Smith will prosecute in both cases. Fortson, represented by court-appointed attorney Christopher Wencker, is facing one first-degree misdemeanor charge of retail for allegedly taking close to $500 in hair care products from Walmart March 31 of last year. State police at Huntingdon say the store’s in-house asset protection staff caught the defendant on camera removing the items from their packaging before leaving the premises without paying. Police say the items Fortson allegedly took included hair straighteners, a heat tool, four curling irons and bronzer, valued together at $478.62. A jury of five women and seven men will hear the case starting at 9 a.m. Thursday, Jan. 24. Price, represented by Huntingdon County’s chief public defender Fred Gutshall, is charged with the second-degree misdemeanor offense of retail theft relative to an alleged incident May 21 of last year at Martin General Store along Route 22 in Porter Township. State police at Huntingdon allege Price took various snacks valued at $15.77 from the convenience store. Nine women and three men were selected to hear Price’s one-day trial scheduled for 9 a.m. Tuesday, Jan. 22. Monday’s court session marked the first criminal trial selection of the new year. Huntingdon County President Judge George Zanic said 35 cases were scheduled leading up to selection day but noted the collective efforts of prosecutors and defenders working Friday and throughout the day Monday resolved a number of cases through pleas and other circumstances. At the end of the selection process, the judge took one of the prospective jurors — who demonstrated his displeasure throughout the morning with being called for jury duty — into the secondary courtroom for a brief contempt hearing. Zanic compared Thomas James’ behavior to that of “class clown” and explained his conduct was inappropriate. “I could fine you,” Zanic said, but he instead ordered James to report for jury duty March 4. — Carlos Lopez-Perez, 53, entered a guilty plea to simple assault relative to an incident in the dining hall at SCI Huntingdon Aug. 14, 2017. State police at Huntingdon say Lopez struck a corrections officer with a metal lunch tray at which point a food service instructor intervened and suffered a broken leg as he and Lopez fell to the ground. Police say the employee required two surgeries to repair his leg. Lopez will serve one to two years consecutive to his current sentence — a three-to-seven-year span on drug-related charges out of Lancaster County. — Raymond Hainey, 33, was fined $100 and sentenced to six to 12 months for a first-degree misdemeanor charge of contraband, specifically a cellphone, while incarcerated at SCI Huntingdon Jan. 27, 2018. Hainey, now housed at SCI Rockview, is serving 15-30 years in state prison on a third degree murder conviction out of Philadelphia County. Monday’s sentence is concurrent to the time he’s already serving. — Ronald Branham, 38, received a $50 fine for a misdemeanor charge of possession of a controlled substance. State police at Huntingdon report 57 pieces of Suboxone were found in Brantham’s jacket during a search at SCI Huntingdon Oct. 30. 2017. Cromwell Township Supervisors, from the left, Ken Leidy, Jeremy Young and Kenny Wilson presented a plaque to Estal Fleck in honor of his father Lewis Fleck’s 20 years of service to the township as a supervisor during their annual reorganization meeting Monday. The supervisors of Cromwell Township paid respects to a former supervisor at Monday’s meeting with a presentation of a plaque in honor of 20 years of service from Lewis Fleck. “He has done a lot for Cromwell Township and a lot for the community, and everybody knows Lewis in the community. We felt that he really deserves this,” said Supervisor Kenny Wilson. The supervisors presented the plaque to Fleck’s son, Estal, in his absence. “The main reason he ran for supervisors was to get the weight limits off of the road. He was a trucker, and he said if the roads won’t hold up, we’ll make them so they will,” said E. Fleck. After nearly a decade since Fleck resigned from his position of supervisor, the current supervisors and secretary Dave Brenneman took it upon themselves to send recognition where it is due. “We were discussing the problems of the township in the past, and we decided he deserved this. If anybody who served a township for 20 years would deserve this, he did. So I called an ordered the plaque,” said Brenneman. The supervisors also held their reorganization meeting Monday, which resulted in Ken Leidy retaining the role of board chairman, and Jeremy Young as vice chairman. Brenneman was appointed to retain his roles as secretary, treasurer and emergency management coordinator. Leidy and Brenneman were also appointed to continue in their positions as township roadmasters. Rich Wilson was appointed to retain his role as solicitor, as well as Stiffler and McGraw to continue as the township engineers. Jamie Catanese was selected to be the sewage enforcement officer, and Polly Greybill was selected as the alternate. Steve Price was selected to the vacancy board. The township will continue to share the Real Estate Transfer Tax with Southern Huntingdon County School District with one half of one percent. The board set the wages for the secretary/treasurer, road crew, and emergency management coordinator at $15 per hour. The board selected to keep the current meeting dates and times the same for 2019 at 7 p.m. the first Monday of the month at the township building. During the regular meeting portion, the supervisors approved the minutes from the Dec. 3 regular meeting as well as the Dec. 19 special meeting. They also approved the current list of bills and financial reports. In the secretary’s report, Brenneman reported Patrick Horne was granted a permit to build an additional garage on his property. Michael can be reached at dnews@huntingdondailynews.com. State police at Huntingdon are continuing to investigate a series of thefts at vending machines that took place in the county in the early-morning hours of Jan. 3. 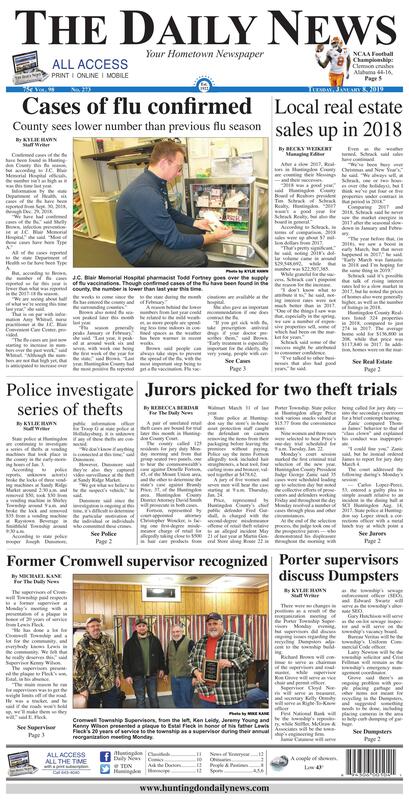 According to police reports, unknown actor(s) broke the locks of three vending machines at Sandy Ridge Market around 2:30 a.m. and removed $50, took $30 from a vending machine in Shirley Township around 9 a.m. and broke the lock and removed $35 from a vending machine at Raystown Beverage in Smithfield Township around 9:30 a.m. According to state police trooper Joseph Dunsmore, public information officer for Troop G at state police at Hollidaysburg, it is unknown if any of these thefts are connected. “We don’t know if anything is connected at this time,” said Dunsmore. However, Dunsmore said they’re also they captured video surveillance at the theft at Sandy Ridge Market. “We got what we believe to be the suspect’s vehicle,” he said. Dunsmore said since the investigation is ongoing at this time, it’s difficult to determine the particular motivation of the individual or individuals who committed these crimes. Dunsmore also noted if a suspect is apprehended and, ultimately, convicted of the crime, the consequences of the crime will undoubtedly outweigh any gain received from committing the crime. “Unfortunately, a lot of times, people do a lot of things where the risk is far greater than any potential reward they would receive from criminal activities,” he said, noting once a suspect is apprehended and convicted of the crimes, the penalties they pay far outweigh the money they collected from the vending machines. “Once the individual or individuals are tracked down, the punishment and fines associated with the crimes far exceed any compensation they get from the criminal acts,” said Dunsmore. In addition to the theft charges, the individual or individuals who will be charged for these crimes will likely face criminal mischief charges as well, said Dunsmore. After a slow 2017, Realtors in Huntingdon County are counting their blessings — and their successes. According to Schrack, in terms of comparison, 2018 sales were up about $7 million dollars from 2017. “That’s pretty significant,” he said, noting 2018’s dollar volume came in around $29,548,692, while that number was $22,507,385. While grateful for the success, Schrack can’t pinpoint the reason for the increase. Schrack said some of the success might be attributed to consumer confidence. “I’ve talked to other businesses that also had good years,” he said. Even as the weather turned, Schrack said sales have continued. Comparing 2017 and 2018, Schrack said he never saw the market energize in 2017 after the seasonal slowdown in January and February. Schrack said it’s possible that talk of rising interest rates led to a slow market in 2017, but he noted the prices of homes also were generally higher, as well as the number of listings in 2018. Huntingdon County Realtors listed 324 properties in 2018, compared to just 274 in 2017. The average home sold for $136,800 in 208, while that price was $117,840 in 2017. In addition, homes were on the market an average 199 days in 2018, compared to 151 days in 2017. Looking ahead, Schrack said he’s optimistic about the new year. The National Association of Realtors predicts mortgage rates will get up to 5 percent by the end of the year. They’re looking for a flat line year,” he said. “I’m hopeful for 2019. I don’t think it will be as good as 2018, but I’m cautiously optimistic it will be close. Schrack said mortgage rages are currently between 4.75 and 5 percent, depending on the term of the mortgage and the lender. He said homebuyers appear to be keeping their lending business more local these days. “Half or more of our sales are financed through some form of local or semi-local lender in Blair, Centre or Huntingdon counties,” he said. Schrack also noted the sale of the home benefits the local economy in many ways, as new homeowners look to furnish a home or make improvements. “I would be willing to bet your hardware stores, paint stores, etc., also had a good year in 2018,” he said. There were no changes in positions as a result of the reorganization meeting of the Porter Township Supervisors Monday evening, but supervisors did discuss ongoing issues regarding the recycling Dumpsters adjacent to the township building. Richard Brown will continue to serve as chairman of the supervisors and roadmaster, while supervisor Ron Grove will serve as vice chair and permit officer. First National Bank will be the township’s repository, while Stiffler, McGraw & Associates will be the township’s engineering firm. Jamie Catanese will serve as the township’s sewage enforcement officer (SEO), and Edward Swartz will serve as the township’s alternate SEO. Gary Hutchison will serve as the on-lot sewage inspector and will serve on the township’s vacancy board. Bureau Veritas will be the township’s Uniform Commercial Code officer. Larry Newton will be the township solicitor and Crist Fellman will remain as the township’s emergency management coordinator. Grove said there’s an ongoing problem with people placing garbage and other items not meant for recycling in the Dumpsters, and suggested something needs to be done, including placing cameras in the area to help curb dumping of garbage. Most recently, Grove said he found hamburger meat in the Dumpsters. Norris said he notified Park’s Garbage last week to come and clean out the Dumpsters when they were full. Ed Kammerer, representing Stiffler McGraw & Associates as township engineer and the Alexandria Volunteer Fire Co.., said the same issues occurred when the recycling Dumpsters were located near the fire hall in Alexandria Borough. Township supervisors said they would also do more research about the Pennsylvania Public Entity Energy Consortium to see if this would be something from which they could benefit on electric bills. “We got a call from the PPEEC said they could negotiate electric payments if we joined this consortium,” said Norris. Brown suggested he speak again with the representative to see exactly how this will benefit the township. Supervisors also approved allowing the township tax collector to receive 5 percent of the fire tax that was approved late last year. Kammerer said they want all of the tax collectors in all municipalities that agreed to a fire tax to collect the same percentage. Brown was also approved to represent the township on the auditing committee for the fire tax monies collected.